We're pleased to announce a limited preview access for the upcoming ClearDent Version 9 coming this fall. Alternatively, please give support a call at 1-866-253-2748 x 2 or inquire via email should you have further questions. As the opening is limited, sign up early to obtain your access to the new version. Friendly Reminder: if you have not participated in our annual performance survey, please take a moment to fill it out - your feedback is important to us and don't miss your chance to win a FREE lunch! What is the Preview Access? You can think of our limited Preview Access similar to a private tasting at your favourite restaurant, where the executive chef invites you to experiment a new menu not yet available to general public in order to fine tune the dishes. All the dishes on the new menu are of fine quality, but there could be a few things that can be tweaked and the chef would only know for sure what those tweaks should be after getting some real feedback during the private tasting. Get feedback on the new features and see what last minute tweaking we can do to make what’s good great before the final release. Find out how people are learning the new features so we can prepare appropriate training videos and summary documentations that will make sure the upgrade will pay dividends immediately because we've prepared sufficient documentations to make the new features easy to learn and easy to master. Learn in advance what are other new features that you'd like us to get started right away after the official release of version 9. Take out trivial, but somehow missed bugs before the final release. Think of joining the Preview Access like getting a head start - you will be able to learn new features and start taking advantage of them before others. In addition to that, during the duration of the preview program, your office will get priority service so we can get to know your feedback quicker. More importantly, if your feedback is something we can incorporate before the final release, then the final release will feature your suggestion and it’s almost like a customized ClearDent just for you. No, all updates of ClearDent are FREE, including Preview Access. Is this a beta version? When does the Preview Access end? End of August or when official release is available, whichever comes first. During the Preview Access, if there are little or no bugs reported and the feedback are generally about minor stuff, we will end the Preview Access early and release version 9 to all customers. Is the Preview Access first come, first serve? The number of staff in your practice. If the openings have all been taken - it's a limited Preview Access and we will only be accepting 5 dental practices. New high-resolution drawings - charts are now crisp, sharp, and looks great on monitors large or small. Restorative drawings such as fillings are even more anatomically correct. 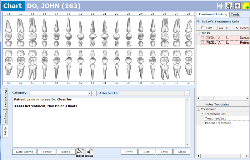 Templates now can read information from the database, including the treatment information so composing a note such as "Composite on Tooth #36 on MOD" can be fully automated. Templates now can also incorporate user defined fields such as prompting you with a list of checkboxes for types of occlusion, plaque buildup, anaesthetics used, etc. Notes entry has been combined with treatment list so you can see a list of treatments and notes, images, exams, and more at the same time. Improved stability and also new spell checker that will ignore spellings of text pulled from the database (e.g., patient names, which sometimes don't exist in the common English dictionary). Dynamic custom fields that will allow you to automate letter writing with multiple choices similar to the clinical notes. Future appointments for the entire family will be listed before the booking is confirmed. More search option in the Treatment Plan Manager to help identify stalled treatment plans. Referral can be searched easily across the entire system. Routing Slip to have a "condensed" view of a patient or a family of patients of their current and upcoming treatment plans, current and upcoming recalls, and insurance and financial information. Chart Audit report that will display a patient, an arbitrary list of patients (such as a family of patients or a list of patients for a specific provider) their most up-to-date recalls, hygiene, last Pan, last BW, last PA, etc. Quick access to mount and new presentation mode.